Father is a significant concept. He stands for the person who caused our birth and the one who took endless pains to make us what we are today. Fathers’ Day is celebrated to honor the deeds of every father or father figure in this world. It is an opportunity to every one of us to reciprocate our love and care to our father. Gifting him, exchanging a warm hug or simply spending time with him on the day can do wonders in a father-son or daughter relationship. Although it is celebrated on various dates worldwide, many countries including India observe this day on the third Sunday during the month of June. Often, it is our fathers who are responsible for passing on their attitudes towards money, work and life. This in turn influences many of our key financial decisions. Karma determines who your father is in this life and what your relationship would be like. It also determines your financial intelligence quotient. The Divine has ways to change your F.I.Q. – Financial Intelligence Quotient. This year Fathers’ Day occurs on June 19th, when the Moon is in the sign Capricorn. We therefore take Capricorn then as the “1st House” in analyzing the indications of celebrating Father’s Day. Venus, the 9th sign from Capricorn is Libra and its lord is Venus. The 9th sign signifies father and fatherly person. The planet Venus is in its own sign of Taurus, which is good for fathers. However, the planet that governs “father” in astrology is Lord Sun and it will be in the 6th sign to Capricorn, which is not good particularly as it indicates debt, health and conflicts for the father. However the discomfort caused by the Sun will be over-ruled by the planet Venus. Lakshmi, the Goddess of Wealth, rules the planet Venus and is the consort of Lord Vishnu, the God of Wealth, who is also known as the ‘Preserver’ or ‘Maintainer’. Moreover, He rules the material world. 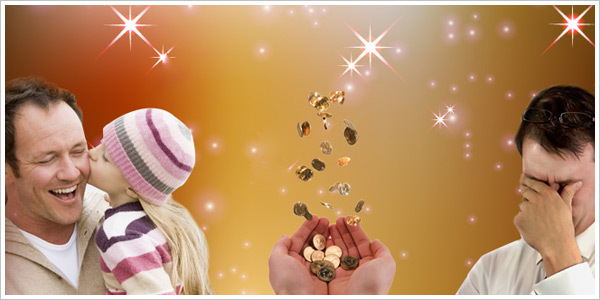 This means the planet of wealth and material comforts will help you to ease the problems in your relationship with father, this Fathers’ day. The 9th house in your horoscope or chart relates to your father. Vedic Astrology can analyze the aspects of your 9th house to ascertain the karmic factors involved in your relationship with your father. They will prescribe suitable astrological remedies to enable you to mend your specific relationship problems with your father. These remedies will be tailor made for your specific father karma. Performing Homa on this auspicious day can nullify the ill effects if any, and can strengthen your bond with your father. The difference that lies between you both can also be narrowed. You can be responsible to take steps to celebrate the positivity with your Father and to heal the wounds, this Fathers’ day.